Ballantine's believes in the artists and pioneers who are paving their own way to greatness by staying true to themselves and make music their way. Now, we're bringing you exclusive access to their inner workings; their success, struggles and creative process, making music born from passion not compromise. Through a new podcast series. It’s your creative portal into what it means to never compromise, and learn from those who are already breaking new ground. All you have to do is press play. 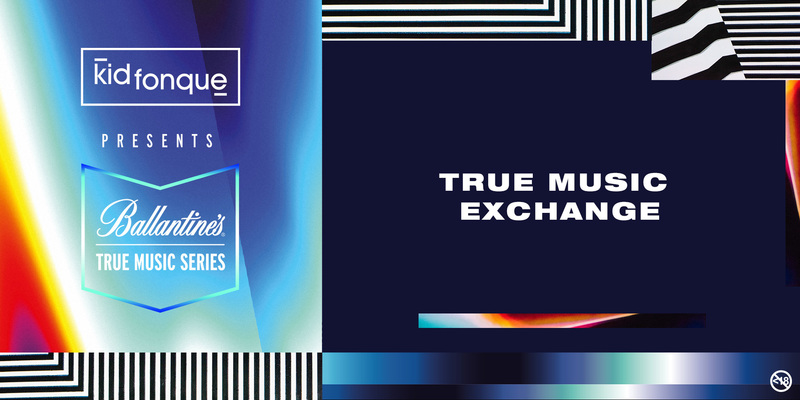 Ballantine’s is bringing you exclusive access to artists’ inner workings, successes, struggles and creative processes through a new podcast series – True Music Exchange. It’s your creative portal into what it means to never compromise, and to learn from those who are always breaking new ground. In Episode 1 Kid Fonque interviews Jullian Gomes & Atjazz. They talk about the start of their journey all the way up until their most recent album launch. The interview is followed by a back-to-back live recording from their #TrueMusicSeries show in Pretoria, where both artists performed in front of striking audio-reactive artwork created by graffiti artist Felipe Pantone. In Episode 2 of Ballantine’s new podcast series, True Music Exchange, Kid Fonque interviews Fka Mash. They talk about their careers and what makes Fka Mash the big success as a producer and DJ he is right now. The interview is followed by a live recording from his #TrueMusicSeries show in Pretoria, where he performed in front of striking audio-reactive artwork created by graffiti artist Felipe Pantone. In Episode 3 of the Ballantine’s True Music Exchange, Kid Fonque sits down with rising duo JayEm. Listen as they talk about their journey from friends to partners and about a potential new project with performer J'Something. The interview is followed by a live recording from their #TrueMusicSeries show in Port Elizabeth, where JayEm performed in-front of striking audio-reactive artwork created by graffiti artist Felipe Pantone. In Episode 4 Kid Fonque interviews one of the OG's of the SA game, the legend and musical genius, Vinny Da Vinci. They talk about his story, how it all started and the fact that he will never, ever stop DJ'ing. The interview is followed by a live recording from his #TrueMusicSeries show in Port Elizabeth, where Vinny Da Vinci performed in front of striking audio-reactive artwork created by graffiti artist Felipe Pantone. A purveyor of all things deep, Kat La Kat specialises in soulful and carefully selected rare grooves. The artist has earned a somewhat legendary status over the past few years, largely thanks to the sterling quality of his Deep Vibes mix series and his incredible ability to weave together stories with his complex sounds. In this session of True Music Exchange, Kat La Kat chats to host Kid Fonque about his hometown of Pretoria, the place he has noted as the original location of Deep House in SA. He also talks about his selection of music, his music philosophy and so much more. The interview is followed by a live recording of this deep house musician’s #TrueMusicSeries show in PTA where he shared his musical stories in -front of striking audio-reactive artwork created by graffiti artist Felipe Pantone. Trancemicsoul’s meteoric musical journey is as inspiring as it is deserving. From humble beginnings in his bedroom in the late 90’s to club rooms and stages that stretch from Pretoria to Barcelona. Taking cues from House, Jazz, Down-tempo, Hip-hop, Kwaito, Broken Beats, Lounge and Electronic sounds, Trance describes his sound as melancholic and deep and soulful. When he looks for music to DJ, he looks beyond the beat into the attitude of the track, the style of production and most importantly the emotion it conveys. In Episode 6 of True Music Exchange, host Kid Fonque chats to Trance about his early work with the Red Bull Music Academy, an experience he has noted, changed him, opening his mind to the endless possibilities’ music has to offer. The interview is followed by a live recording of his fire #TrueMusicSeries set in PTA. Pierre Johnson, a DJ & Producer based in Cape Town, is taking on SA’s electronic music scene by force. With his easy-going electronic style, dreamy keyboard washes, jazzy flourishes and occasional vocals, Johnson is turning heads of the most seasoned of listeners. In Episode 7 of True Music Exchange, host Kid Fonque and Pierre chat about how he dealt with creating and distributing his music in the early stages of his career. The interview is followed by a live recording of his #TrueMusicSeries set in PTA.